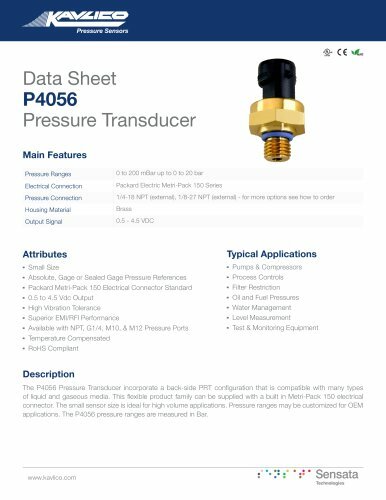 Data Sheet P4056 Pressure TransducerMain Features Pressure Ranges Electrical Connection Pressure Connection Housing Material Output Signal 0 to 200 mBar up to 0 to 20 bar Packard Electric Metri-Pack 150 Series 1/4-18 NPT (external), 1/8-27 NPT (external) - for more options see how to order Brass 0.5 - 4.5 VDC Typical Applications ■ Pumps & Compressors ■ Process Controls ■ Filter Restriction ■ Oil and Fuel Pressures ■ Water Management ■ Level Measurement ■ Test & Monitoring Equipment Attributes ■ Small Size ■ Absolute, Gage or Sealed Gage Pressure References ■ Packard Metri-Pack 150 Electrical Connector Standard ■ 0.5 to 4.5 Vdc Output ■ High Vibration Tolerance ■ Superior EMI/RFI Performance ■ Available with NPT, G1/4, M10, & M12 Pressure Ports ■ Temperature Compensated ■ RoHS Compliant Description The P4056 Pressure Transducer incorporate a back-side PRT configuration that is compatible with many types of liquid and gaseous media. This flexible product family can be supplied with a built in Metri-Pack 150 electrical connector. The small sensor size is ideal for high volume applications. Pressure ranges may be customized for OEM applications. The P4056 pressure ranges are measured in Bar.